This problem can be solve by counting points that have the same slope for each point. When counting, we need to be careful about the duplicate points and points on the vertical lines. Java read a file line by line – How Many Ways? Because the point itself is counted in duplicate. Otherwise, the point would not be counted in the line based on itself. Why should the “duplicate” variable be initialized “1” instead of “0”? Valid point.. has anyone found solution to parallel lines case? This solution is not right. As Aditya and AR pointed out below. Just comparing slop is not enough ..also double as key will not work as well ? What happens when two lines are parallel. They have the same slope but are not collinear? This is clearly wrong. 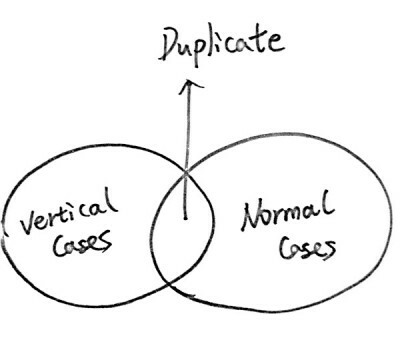 If you are storing the slope as a double you might never get a match for certain cases. We should store it in fractional form of p/q. I believe time complexity here is O(n^3). Can we reduce it to O(n^2)? what is the “1.0” for? I forgot this part the it stuck at 20/27 test case. There is at least 2 points for each line.